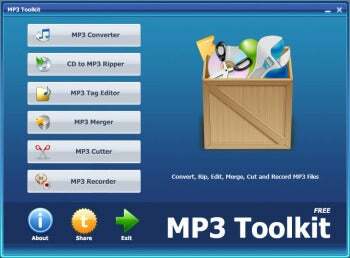 MP3 Toolkit is simple and it works, letting you convert audio files to a number of different types, merge multiple files into one, clip files for ringtones or the like, edit tags, rip files from CD, and record using a microphone. There's nothing spectacular about it, unless you're impressed that it's free. The main launcher for MP3 Toolkit is colorful and easy to use. So are the modules, though selecting multiple items doesn't follow Windows conventions. The suite (MP3 Toolkit is a collection of modules) is easy to use--for the most part. There are small oddities, such as not being able to select multiple items with the shift key. Instead you select folders from within the folder. Not unheard of, but against the normal Windows convention. My only major complaint is the lack of batch editing in the tag editor. It can be extremely handy to grab a bunch of files to specify their genre all at once. MP3 Toolkit doesn't allow this. MP3 Toolkit converted every file I threw at it with one exception--Windows Lossless, a relatively rare bird. It did, however, convert Apple Lossless, Flac, APE, TwinVQ (an even rarer bird), and wave files up to 24-bits/96Hz, as well as all the more common types such as MP3 and WMA. The merger tool worked well, as did the cutting tool, though it wasn't initially obvious that the material between the markers I set was being saved, not cut. Small oddities aside, MP3 Toolkit works as advertised. It's free, it's effective, what more need I say? Perhaps that if you'd like all your tools under one roof, fre:ac and Freemake Audio Converter are worth a look as well. Handles a number of MP3-related chores, including ripping and converting file types, with MP3 Toolkit.